Rio de Janeiro: Robots will help guard Pyeongchang 2018 and specially designed technology will lower language barriers in the most high-tech Winter Olympics yet, the Games’ chief organiser told AFP. Organising committee president Lee Hee-Beom also said drones would be used extensively at a “state-of-the-art” Olympics which will trade heavily on South Korea’s technological expertise. “Not only for security also for some other areas,” Lee said in an interview at the Rio Olympics, when asked how robots would be used in Pyeongchang. “We are aiming at a barrier-free Olympic Games so we will do our best to make it language barrier-free, age barrier-free, handicap barrier-free. While details of the technology, some of it still under development, were not revealed, South Korea’s technical advances of recent times throw up some tantalising possibilities. South Korean-designed HUBO humanoids have sophisticated voice recognition and vision and can walk, roll on four wheels and even climb stairs. The HUBO picked up a $2 million prize last year in a competition in which it had to drive and exit a vehicle, open a door, cut through a wall and find and close a leaking valve. A South Korean arms manufacturer has also developed a robotic sentry which is able to identify, warn, track and — if commanded — shoot intruders. But Lee said the technology in use at Pyeongchang would be “not only robots”. “We are preparing state-of-the-art technologies,” he said. “As you know, Korea is well advanced in the IT business. “We have many advanced companies including Samsung and other venture companies so we are developing state-of-the-art technologies in the area of information technology, and we will use state-of-the-art technologies including robots. In December, Pyeongchang organisers signed an agreement with two government ministries covering automatic interpretation technology to break down the Korean language barrier for foreigners. Lee only took charge of the Games in May after the abrupt resignation of his predecessor, shipping magnate Cho Yang-Ho, but he said preparations are largely on track. 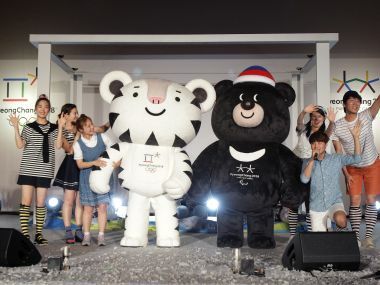 Infrastructure — including the Games venues, a new high-speed rail link connecting Pyeongchang to Seoul and Incheon, and a new expressway — will all be completed on time, he said. The Games’ original budget of 2.2 trillion won ($2 billion) is under review but should rise less then 15 percent, a Pyeongchang spokesperson said. Lee was in Brazil to observe Rio’s hosting of the Games and he left with a notebook bulging with ideas and checklists. “Thirty years ago we had the Seoul Olympic Games. With the Seoul Olympic Games, we think that Korea became a country of the world,” said the former trade minister. “We could open diplomatic ties with all the countries including all European countries including Russia and other Eastern European countries. Lee added that he was open to South Korean athletes marching at the opening ceremony with North Korea’s team, as happened at the 2000 and 2004 Summer Olympics and the 2006 Winter Games. “We are open to any kind of suggestions but so far we have not decided anything yet. It’s our hope,” he said, when asked if the two Koreas would march together.